End 2016 on a high note with special holiday discounts! 2016, we hardly knew ye. Say hello to the new year with some new gear, and save a buck while you’re at it. Note that all of the below deals end when 2016 does—get them before Dec. 31 2016—after that, they’ll be gone! Never a better time to buy Notion—along with an entire symphony of add-ons! 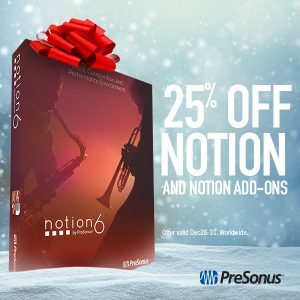 Everything from sopranino saxophones to cowbells is available from the Notion Add-on library, every single one of them is 25% off. And Notion itself is 25% off, as well. Start building your personal orchestra for cheap! Hurry, ends Dec. 31, 2016! 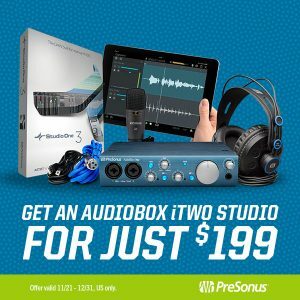 Customers in the USA can get the AudioBox iTwo Studio for a significant discount, down to $199 from QQQ. Get everything you need to get started in recording, including an audio interface, Studio One Artist, the M7 Microphone, HD7 headphones, and… ALL REQUIRED CABLING! That’s like including batteries—it just never happens! 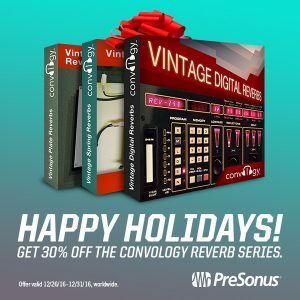 Add some vintage mojo to your workflow with this incredible reverb series from Convology for Studio One. They painstakingly modeled tons of old reverbs from old reverb devices both analog and digital. All members of the family are available for 30% off, including Vintage Plate Reverb, Vintage Digital Reverbs, and Vintage Spring Reverbs. Get ’em all and you’ve got every reverb you’ll ever need and then some.